A school trip or corporate event? The benefits! for a school trip or corporate event! Deciding which mode of transport is most appropriate for a corporate event, a school trip or even a wedding day can seem stressful, you need to accommodate for a lot of people. Public transport or individual car hire is normally the most obvious choice; initially, people think it is the most cost effective. However, at Green Mountain Travel we provide transport solutions all over the North East, with a high quality, and reliable service from start to finish. With our full Mercedes fleet, we can get you and your party from A to B efficiently for all occasions. If you’re planning transportation for a large group of people, then hiring a bus or coach is the most logical solution. Instead of hiring a few taxis meaning everyone will arrive at different times – why not get a coach for everyone, ensure you all arrive on time and together. Our coach drivers will ensure that this part of your day will be stress-free, we understand that arrangements may change last minute therefore, your driver will be updated with all pick up changes, doing our utmost to get you where you need to be on time. Safety is our top priority at Green Mountain Travel, all of our coaches and minibuses are maintained to the highest standards and fitted with individual seat belts. If you’re planning a school trip and need transportations, then don’t worry – all our drivers are DBS checked. If you split the cost of hiring a coach or minibus per person, it is often a lot cheaper than other modes of transport such as taxis or trains – especially if you fill each seat on the coach. 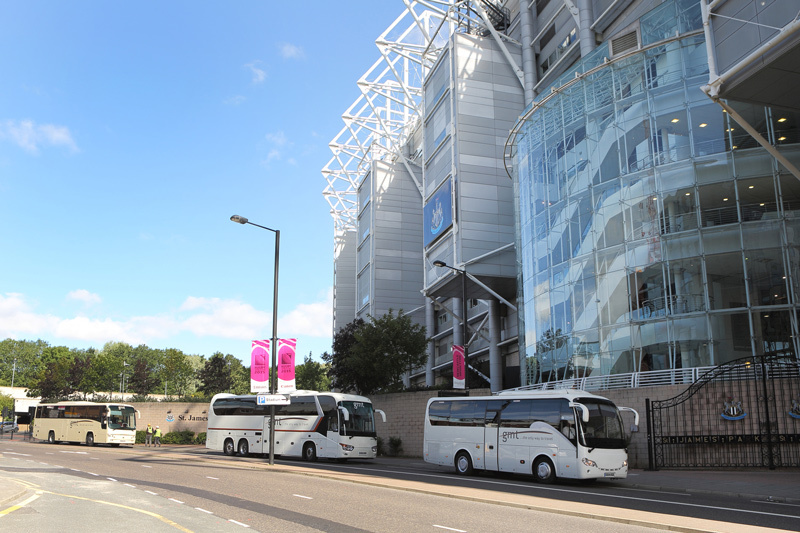 We are one of the Newcastle bus hire companies that put comfort at the top of our priorities. All of our coaches and minibuses are clean, modern and regularly checked. If you’re planning a long journey you want to feel comfortable, our coaches have plenty of luggage space and legroom – ensuring you’re comfortable for your whole journey with Green Mountain Travel. Booking a coach or minibus with Green Mountain Travel couldn’t be simpler. Get in touch today if you have any enquiries. Simply let us know your travel details including your pick-up place, the destination, date and time and also how many passengers you require transport for. At Green Mountain Travel, we provide the highest customer service, also ensuring we provide the best price point, along with a high-quality vehicle. See our website for more information on our bus hire, Newcastle.